I’m using optimistic locking to avoid concurrent modifications of the same entity. But Hibernate’s versioning mechanism ignores changes on the one-to-many association. How can I tell Hibernate to increase the version number when I add or remove a child entity? The version check defined by section 3.4.2. of the JPA specification explicitly excludes relationships that are not owned by the entity. The version attribute is updated by the persistence provider runtime when the object is written to the database. All non-relationship fields and properties and all relationships owned by the entity are included in version checks. By default, the child or to-many site of the relationship owns the one-to-many association. Hibernate, therefore, doesn’t increment the version number of the of parent entity when you add or remove a child entity. But you can use the LockModeType.OPTIMISTIC_FORCE_INCREMENT to trigger the version update programmatically. You can choose between 2 options to set the LockModeType for a specific entity. You either call the lock method on the EntityManager or you perform a JPQL query and provide the LockModeType.OPTIMISTIC_FORCE_INCREMENT to the setLockMode method. The EntityManager.lock method locks a managed entity. So, I first call the find method to load the parent entity by its primary key and to get a managed entity. You can skip this step if your parent entity is already managed. And then I call the lock method with the parent entity and the LockModeType.OPTIMISTIC_FORCE_INCREMENT. 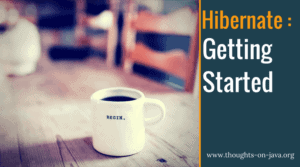 When you activate the logging of the executed SQL statements, you can see that Hibernate performs an SQL SELECT statement to read the Book entity before it performs an SQL UPDATE statement to increase its version number. 08:48:41,902 DEBUG [org.hibernate.SQL] - select book0_.id as id1_0_0_, book0_.title as title2_0_0_, book0_.version as version3_0_0_ from Book book0_ where book0_.id=? 08:48:42,003 DEBUG [org.hibernate.SQL] - update Book set version=? where id=? and version=? You can do the same with a JPQL or Criteria query. The Query and TypedQuery interface provide the setLockMode method. You can use this method to lock the selected entities. In this case, I don’t set a database lock but activate the LockModeType.OPTIMISTIC_FORCE_INCREMENT to increase the version number of the selected entity. As in the previous example, you can see in the log output that Hibernate selects the Book entity before it increments its version number. 08:51:31,395 DEBUG [org.hibernate.SQL] - update Book set version=? where id=? and version=? You can learn more about optimistic and pessimistic locking and their performance impact in my Hibernate Performance Tuning Online Training. Thanks for the detailed tutorial on how to use optimistic locking whenever relationships are involved. However I just wanted to mention that we can obtain the same thing with a small workaround, by adding a ‘ModificationDate’ column in the parent entity which if we modify it whenever the child entities are changed, we get the ‘Version’ column incremented each time. Sure, you can implement your own workaround for that. Updating the parent entity will update the version number and you get the same result. But how do you make sure that every developer in the team will trigger the additional update? And does that also work if someone needs to do a bugfix in a few years?